National Public Radio has a database of individuals who were exposed to mustard gas during World War II. This entry was posted in Uncategorized on December 29, 2017 by mjnrootdig. The bulk of these appear to be pre-American Revolution and are unindexed. But the images are online and they are cataloged by county and year–which facilitates searching. These are hosted on the North Carolina State Archives website. This entry was posted in Uncategorized on December 28, 2017 by mjnrootdig. More details are available on our announcement page. This is a reminder that FamilySearch has these records (including digital images) online. Parents’ names are extracted as well which gives another way to search. This entry was posted in Uncategorized on December 27, 2017 by mjnrootdig. Check out GenealogyBank‘s offer for our fans, followers, and subscribers. This entry was posted in Uncategorized on December 22, 2017 by mjnrootdig. The index is what is online at FamilySearch. Images must be accessed at a FamilySearch center or via a GenealogyBank account. 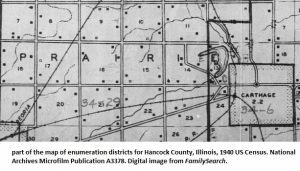 Digital images of United States Census Enumeration District maps (1900-1940) can be viewed at FamilySearch. This entry was posted in Uncategorized on December 14, 2017 by mjnrootdig.